August | 2011 | What about this? Shopping bags are hardly considered stylish accessories, but I have to admit, mine are cute and unique. Completing two weeks of serious and ruthless closet cleaning left me with a stack of clothes that didn’t qualify for the normal “rag, donate, or save-for-weight-loss piles.” I couldn’t toss out Disneyland’s 50th Anniversary shirt or my “Art Breaks the Rules” t-shirt. And what was I going to do with the rainbow-colored tie-dyed shirts I made with my kids? I thought to myself, “What would Martha Stewart do? What would she do with all of these colorful, well-constructed and memorable t-shirts?” Instantly, I knew! Recalling an episode from her show, I set out to make shopping bags from t-shirts. After about 30 minutes, I’d recycled my t-shirts into sturdy, machine washable and definitely unique-looking shopping bags. 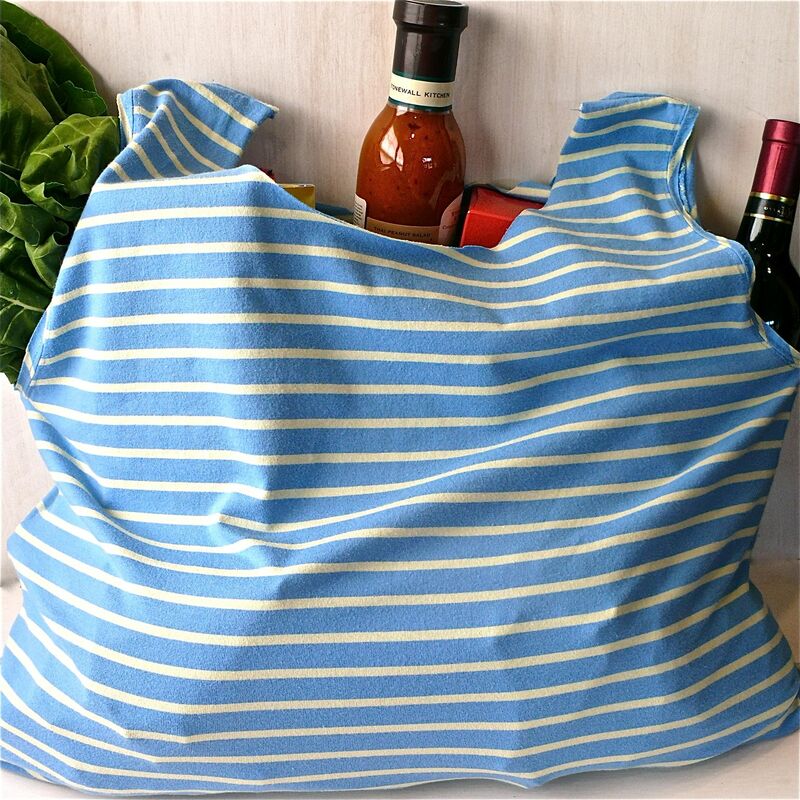 It’s a win-win situation: no need to use store bags, no harmful materials used to make these reusable bags, and no additional waste went to landfills! 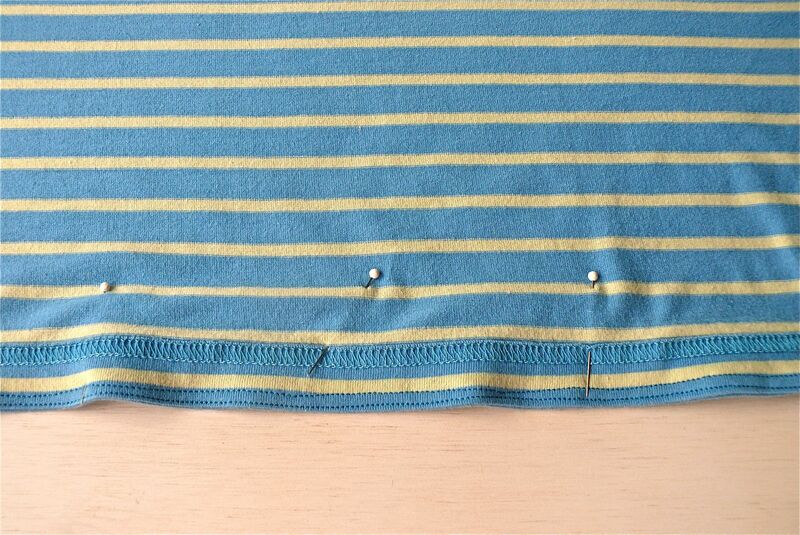 Turn t-shirt inside out and pin bottom of t-shirt along the hem. 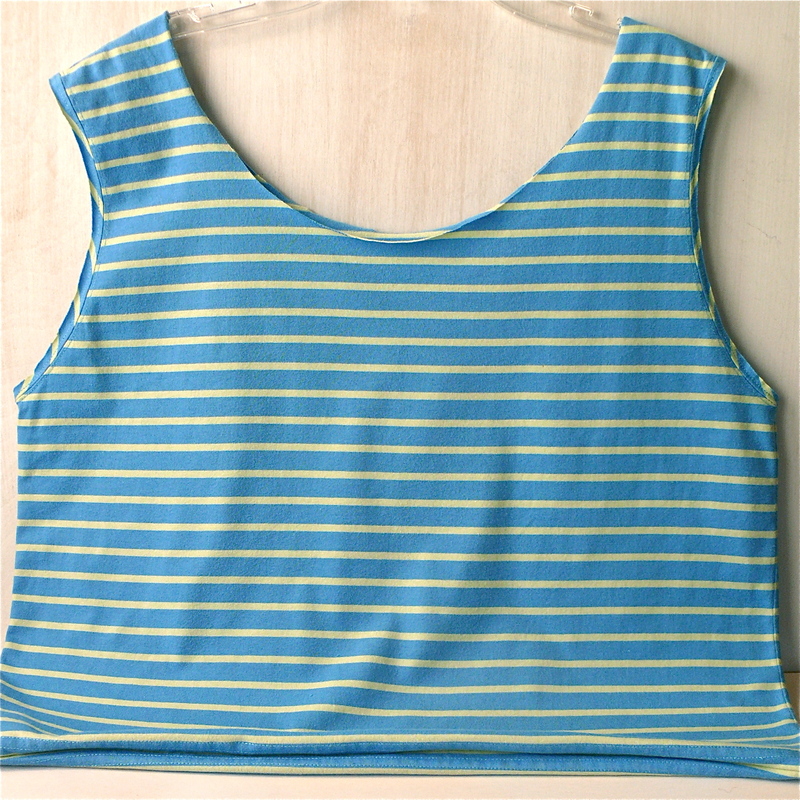 Using a sewing machine, sew the bottom of t-shirt closed. 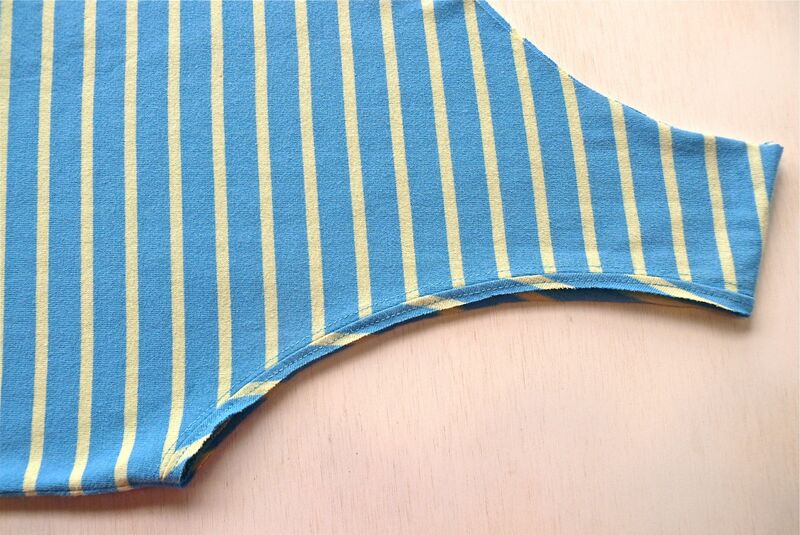 For additional strength, sew a line parallel to the one just sewn. 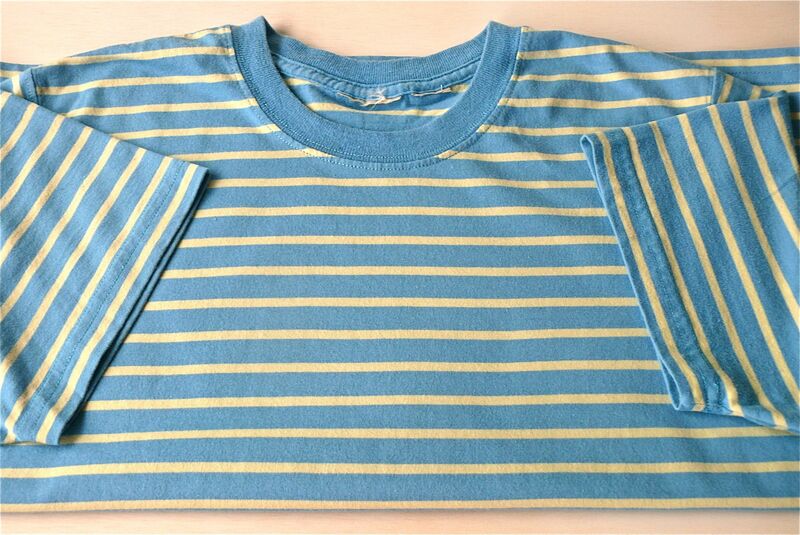 Turn t-shirt right side out and lay flat on table. Place medium-sized bowl (or plate or pot lid) about half way over the neck hole. Using a water-erasable marker or tailor’s chalk, trace along edge of bowl. 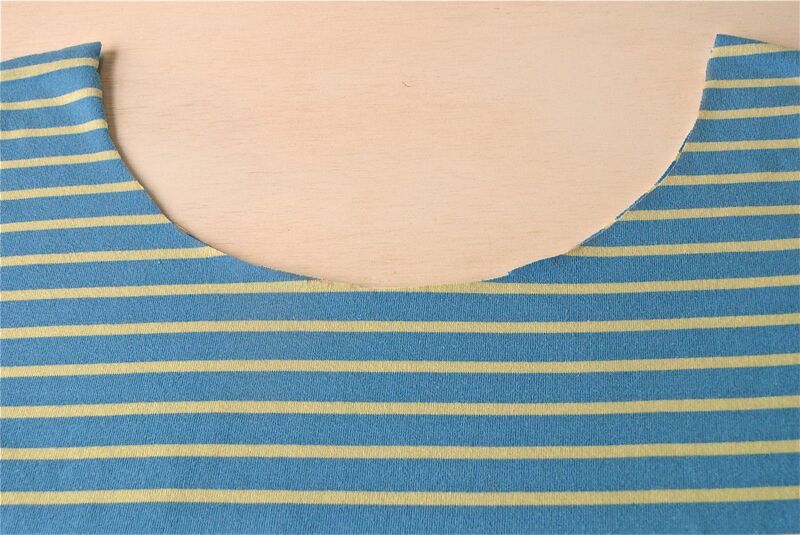 Cut along the outline, making sure to go through the front and back layers of the shirt. Lay shirt flat on a table and line up the hems on the front and back side of the sleeve and cut the sleeve off on the outside of the armhole stitching, making sure to cut through both layers of fabric. Repeat with the other sleeve. Your bag is now complete. 1. Bring the water and quinoa to a boil in a small saucepan. Reduce to a simmer, cover and cook for 10 minutes. Turn the heat off and leave the covered saucepan on the burner for an additional 6 minutes. Remove the lid and fluff with a fork. Set aside to cool. 3. Cream the butter with the brown sugar in a large bowl. Add the eggs and vanilla and mix thoroughly. 4. Combine the flour, baking powder, baking soda, cinnamon and salt in a medium bowl. Add the oats, cooked quinoa, coconut, sunflower seeds, flax and sesame seeds to the flour mixture and stir until well blended. Combine with the butter mixture and stir until well mixed. 5. Roll the dough into 1-1/2-inch balls. Place 2 inches apart on a baking sheet. 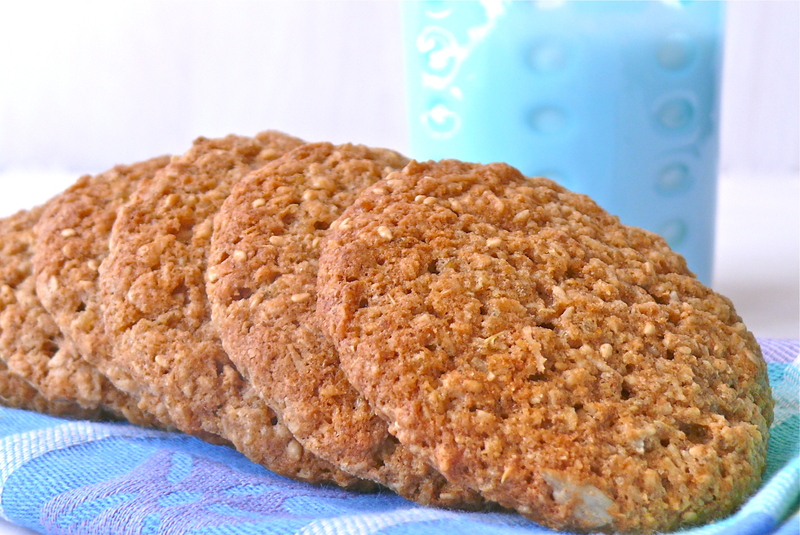 Flatten each cookie slightly with the palm of your hand. 6. Bake on the center oven rack for 8 to 10 minutes, until the bottoms are light brown. Allow the cookies to cool completely on the baking sheet. 7. Store in a sealed container in the refrigerator for up to 1 week. 1. Don’t forget to rinse the quinoa before cooking it. This needs to be done to remove the saponin coating on the grains or else they will taste bitter. 2. I only stock steel cut or rolled oats in my pantry, so to make quick-cooking oats, I just put some of the rolled oats into my food processor and whirled them a bit to break down the flakes. 3. Like walnuts and pecans, sesame seeds are more flavorful when they are toasted. Toast some in advance and then put them in the freezer for later use. 4. Cover the cookie sheets with parchment paper to make sure the cookies don’t stick. Don’t forget that parchment paper can be reused. After baking and cooling I wipe the paper down and store them on the baking sheets. 5. To handle the sticky dough, moisten your hands with water first. Re-wet hands as often as needed. No Friday’s Fresh Five! today, but a few thoughts to share while riding in the car. “I have big doubt that he’ll ever be successful.” Those hurtful words uttered by a relative years ago replay in my mind as I think about the upcoming weekend. I think about how someone, who should be in a position of love and support, could declare such discouraging and dismissive words about someone still so young. 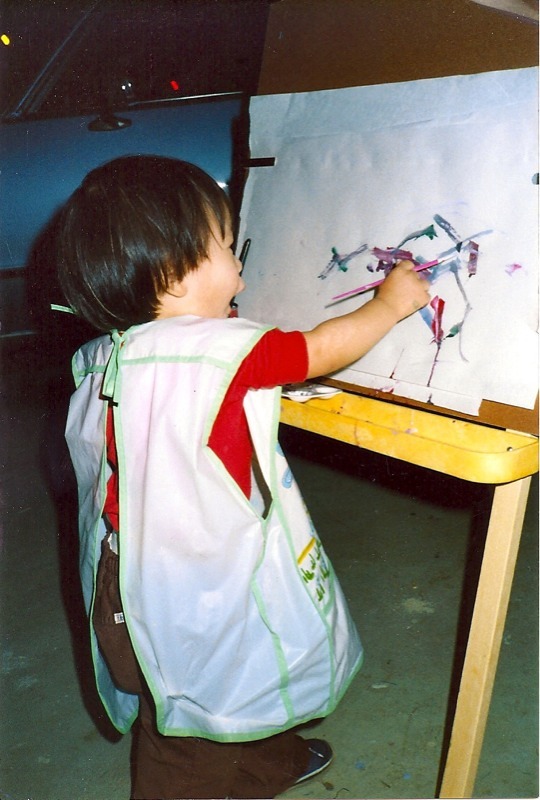 At the heart of the matter is my son’s chosen life path – art. In defense of my son, I try to reason with this relative. I explain that my son has not chosen art, but it has chosen him. I am told that I should have forced my son to become a doctor. There is no reasoning with this person. If my son ignores his gift, he would deny his authentic self and would be unable to truly share himself with the world. This weekend my oldest son will graduate from a prestigious art and design college and will start a position with one of the top advertising agencies in the country. Filled with zigs and zags, his path has not been an easy one, but with perseverance, belief in himself, and supportive parents, he’s on his way to living his dream. So bravo! Hip-hip-hooray! Congrats to you, son, for staying true to yourself and not listening to the naysayers. Summer isn’t summer unless watermelons are on the menu. There’s nothing quite like biting into a slice of crisp, juicy-sweet watermelon on a hot summer day. To that end, I double your delight by presenting two recipes that highlight the qualities of watermelons and create surprising melon moments at the beginning or at the end of your meals! Watermelon for appetizers? You betcha! This appetizer has it all: a salty and tangy dip juxtaposed against the sweet crunchiness of melon, with an added a kick at the end. So unexpected, but so delicious! 1. Cut melon into small 1-inch wedges (with rind) and place on serving platter. 2. Make Asian Dipping sauce by mixing together the lime juice, rice vinegar, pickled ginger, sugar, and fish sauce. 3. 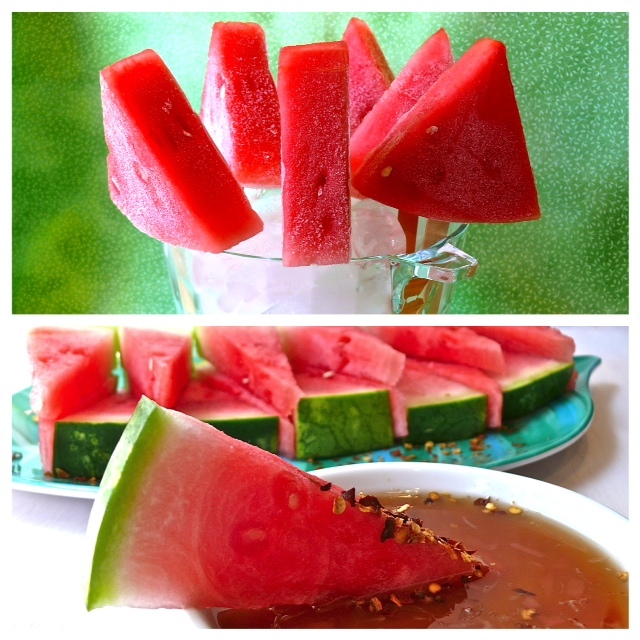 Place dipping sauce in a small, shallow serving dish next to watermelon platter. 4. Place crushed red chilies in another small, shallow serving dish and place this next to the watermelon platter as well. 5. To eat, dip melon into sauce, then into chilies, as desired. Eating watermelon for dessert is not unusual, but this recipe for Watermelon Icicles shines because of its simplicity. It’s a perfectly refreshing and low-calorie treat for a hot summer day. 1. Cut watermelon into triangular-shaped pieces about 1-inch thick and 3-inches wide at the base. Remove rind. 2. Push an ice cream stick into the wide part of the slice, almost all the way through. 3. 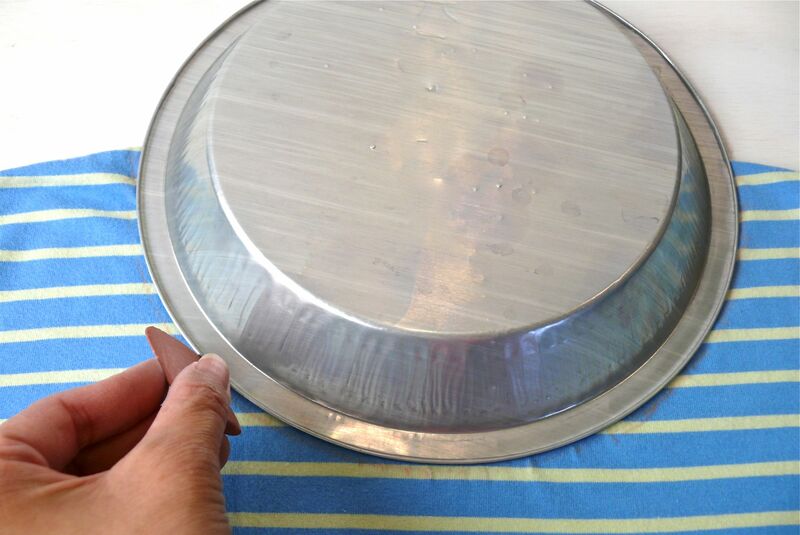 Cover a flat baking sheet with wax paper or parchment paper. 4. Lay the watermelon wedges in a single layer on the baking sheet. 4. Freeze until solid, about four hours. 5. Serve, or transfer to a freezer container and freeze up to 1 month. Day or night? Which time of day do you prefer? There are some (not just vampires and werewolves!) that feel a sense of renewal during the evening. Maybe it’s the peaceful quiet that envelops them as the day’s rhythm shifts and settles down or maybe it’s the sight of the calming moon replacing the fiery sun that soothes their souls. Where I live, evenings are the best part of the day during the summer; pleasant, often-breezy nights replace high-temperature days to create perfect scenarios for outdoor activities. Years ago, before the trees grew tall and before the ambient light from surrounding homes and local businesses grew bright, stargazing was a favorite summertime activity for my family. 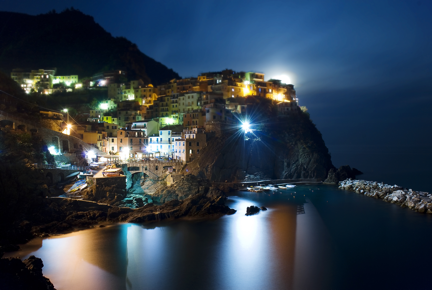 With blankets to lie on, we would settle down on the steep slope of our driveway and enjoy the spectacular stadium-like view of the dark night sky. Although our neighbors must have thought we were crazy, there was magic in just being together and identifying summer constellations and wishing on shooting stars. I wonder how many of those wishes have come true? Ever wonder what prompted Van Gogh to paint his famous Starry Night masterpiece? Here’s an artist’s concept of what Van Gogh’s inspiration may have looked like. Compare the two by clicking on their links. Which “starry night” do you like better? Do you want to save time during the day, so that you have more free time in the evening? Start by being more efficient at everything you do. A video titled How to Do Ordinary Things Quickly shows creative time-saving tips. The clothes-folding segments are fascinating, but I don’t recommend trying to park a car as shown! You are capable of loving and of being loved. You deserve nothing less. You are not perfect. There may be parts of you that you would change if you could, but accept that some things cannot be changed. This acceptance isn’t easy, but it makes you a stronger person. Try your best not to dwell on your imperfections. Instead, try to see them as just part of a beautiful whole. The same things that make you different make you beautiful. There is a difference between giving up and letting go. Giving up is sacrificing what was rightfully yours, letting go is forgetting what was never yours. We can’t gain if we can’t let go. There’s no love without tears, there’s no happiness without sacrifice, and there’s no forever without goodbye. It’s not giving up, it’s more like . . . letting go. There will be two dates on your tombstone. Everyone is going to be looking at them, but all that’s going to matter is that little dash in between them. If you’re out for an evening stroll and the conditions are just right, look to the part of the sky opposite the moon, and maybe you’ll see a moonbow. A moonbow or lunar rainbow is a phenomenon that occurs when light is reflected off the surface of the moon. According to Wikipedia, Moonbows are most easily viewed when the moon is near to full (when it is brightest). For true moonbows, other than those produced by waterfalls or sprays, the moon must be low in the sky (less than 42 degrees and preferably lower) and the sky must be dark. And of course there must be rain falling opposite the moon. This combination of requirements makes moonbows much more rare than rainbows produced by the sun. Camping.com claims that “The two most famous viewing spots in the U.S. are at Cumberland Falls, near Williamsburg, Kentucky and Waimea, Hawaii. In both places, sign up for a guided hike to see the moon bow.” Add this to your list of things to see during your lifetime! 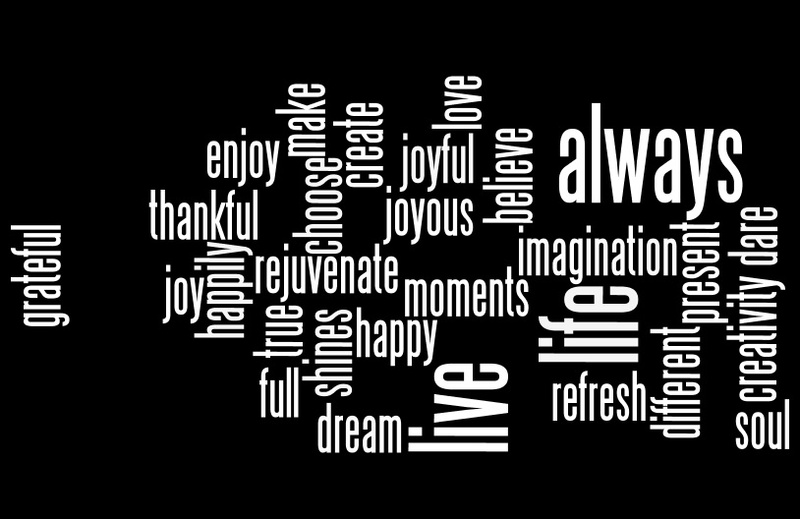 May you find ways to renew your soul this weekend! As the images of people flocking to refugee camps, of pleading eyes and emaciated bodies, and of anguished mothers weeping over their dead children haunt me, I feel extremely guilty about having plenty of food to eat. With every bite of food I take, I am ashamed of not helping those who are starving. Today’s newspaper carries additional news, “Hundreds of thousands of Somali children could die in East Africa’s famine unless more help arrives.” HUNDREDS OF THOUSANDS is a heart-breaking and unfathomable number, but one person starving to death is already one too many. It’s easy to remove ourselves from this news, because Africa is so far away and because we do not witness the daily struggles and tragedies of these people. But we must find a way to help them, because they desperately need our help. Find 20 minutes in your day to watch this TED video featuring Josette Sheeran, the head of the UN’s World Food Program. Learn about the issues surrounding world hunger and the concepts to alleviate it. She challenges the people of the world to “draw a line in the sand and say no more.” If you don’t have 20 minutes to spare, you can see the faces of hunger and learn more about the famine in East Africa by reading this article in the Atlantic. $10 can provide 321 sachets of Multiple Micronutrient Powder containing essential vitamins to give a powerful boost to infant survival and development. $40 can provide a practical and easy to transport scale used to monitor children’s weight. $80 can provide 1000 sachets of Oral Rehydration Salts to help children combat dehydration. 6. Buying new clothes or accessories – instead of buying a new item, donate the cost of that item. 9. Admission to entertainment venues – sports, concerts, lectures, etc. 13. Waxing – eyebrows or bikini! 14. Instead of an impulsive purchase at the grocery counter (think magazines, candy, or gum), donate the money! 20. Greeting cards – it’s the sentiment that counts, so make your own. The cost of two greeting cards could feed a child for over a week! These items are luxuries for most of us, but considering food is a luxury for others, I think we can collectively help by sacrificing something! 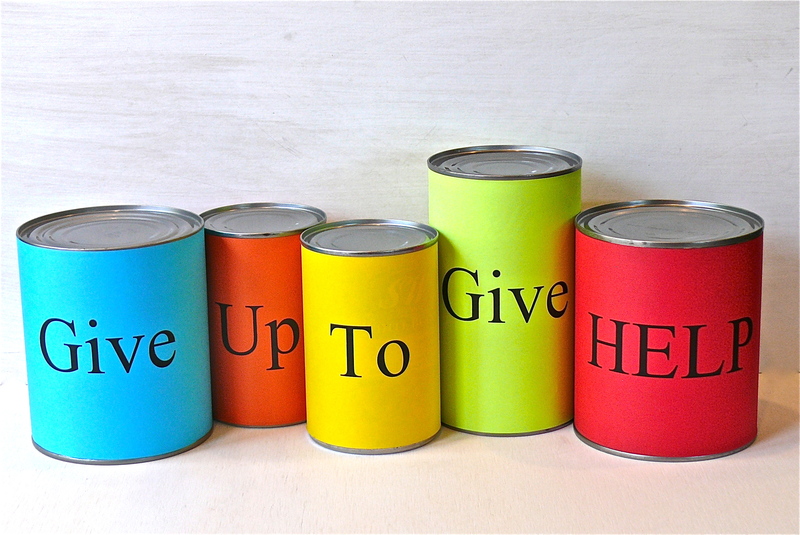 If you have any great ideas for my Give Up to Give Help list, please let me know! What will you give up to help?